Okay. First the disclaimer. This is the fuzzy foto tour. Blah-blah-blah, excuse-excuse-excuse. We are done with that piece. Onward. Lloyd Wright (1890-1978), as he shortened his name from FLW Jr., lived in the shadow of his famous father, but was quite well known in his day for his own achievements in architecture and landscape design. I didn't know much about the young man and was anxious to see his work. This is quite an unusual home. It is configured using the diamond pattern you see on the driveway above. The house is, in essence, a giant diamond shape. Some of the the write-ups refer to it as shaped like a ship's prow. I am not sure if this was the intent, because it is obvious when you are inside and when you look at the landscaping, it is all a repetitive diamond shape. Now, I could break down and re-post the pictures from the current real estate listing (for $945K), but why spoil you? Look at my pictures and imagine the fabulous angles I was going for. Then pop out and glance at the MLS pictures on Zillow to see things more, **ahem**, clearly. I love the single light front door and want one. Our door faces dead West so I won't ever have glass in the door because of the huge blinding glare that would come in on summer evenings. Look closely at this unusual doorbell. Sort of a close up of the intricate dental trim at the roof line This dental detail is repeated in furniture throughout the home. The dental trim is spotted on the underside of the dining room table. The plywood ceiling is stained in two different colors and emulates the diamond pattern of the house and landscaping. Interior floor in the living room area is concrete. These two drawing rulers are supposedly from Lloyd Wright. Cozy living room area. With the requisite Noguchi table. (The Herman Miller sale starts Friday at Design Within Reach; you can get 15% off and free shipping on your very own Noguchi table -- not a paid placement). Very utilitarian light fixtures. Probably not original. I was told the kitchen has been substantially remodeled. I wouldn't have known. It was done totally in keeping with the period. It is also the diamond shape within the greater diamond. Charming tile work. But should have been diamonds. Baby grand sat at the far end of the living room space. The entire side of the living room opens out onto the patio and pool area. The bathroom is a remodel as well. Extremely craftsman. This is the only bathroom by the way. Very utilitarian home. Roomy guest room or originally, the master bedroom. Interior floors in the bedroom areas change to tile. Long hall to get from the front of the house to the back in a straight shot. This was billed as the master bedroom but probably was not originally. This space was originally a screened porch that eventually got enclosed. It is completely surrounded by windows. It is very much a sleeping porch and would have been pretty close to sleeping outside. Pasadena only gets cold a few months of the year. The home has, what is called, passive heating and cooling. So, not entirely sure what that would mean in the winter. Maybe brrrr back in this bedroom. Patio off the back bedroom with the repeated diamond patterns. Awesome diamond shaped pool!!!! (Okay sort of diamond shape but you get the general idea. The pool shape completely repeats the home shape). Large overhang at the back of the house protects the master bedroom from the sun. What an odd set of shapes! Tough to see this picture clearly but this tree forms part of the fence as it is on the property line. More of the diamond from the patio and the end of the back bedroom. Mr. Dorland said it best in a letter to Lloyd when he wrote, It isn't like living, it's like being on vacation. '' This sense of serenity was achieved as Lloyd created this home to blend seamlessly with it's natural surroundings. Awesome mature desert plantings up front. Honestly, this is the perfect home size for me. Just enough rooms to get the job done. And such an utterly pleasant and resort quality yard. One more home to go. 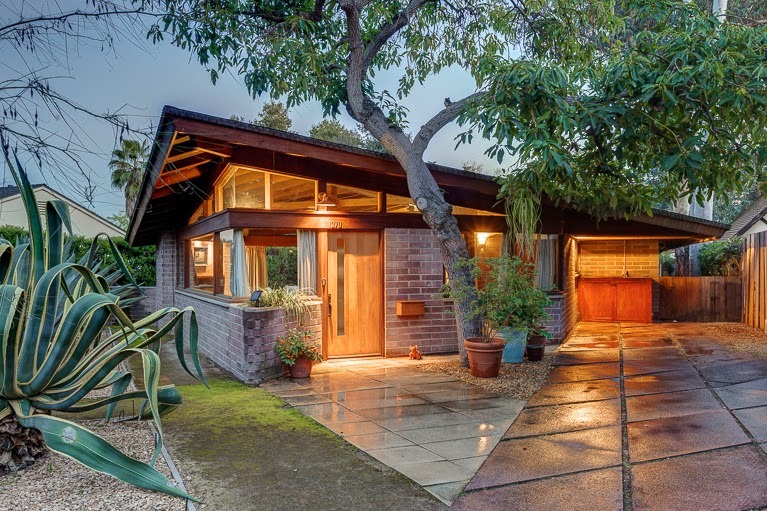 Tomorrow's is a classic mid-century modern. You'll enjoy it for sure. Blurry pictures or not. That's such an interesting house. I love the chevron ceiling and the oddball shapes. The mature plants are fantastic. DUH! That is a chevron pattern!!! I was seeing diamonds everywhere and overlooked the obvious chevron motif. Thanks! As you said, "the perfect home size." And adapting the idea of the sleeping porch is so Pasadena with all the Craftsman homes with their sleeping porches. It is so Pasadena, huh? This one came the closest to a craftsman and probably, truly, really is. A long time ago I moved to Oak Park, Illinois just so I could surround myself with Frank Lloyd Wright homes. I love this house. Thanks for posting it. Smart idea... I do love FLW.